There comes a time in the life of every blogger when he must blog about sandwiches. That day has come. This, dear reader, is my destiny. I consider sandwiches the crowning achievement of humankind, surpassing such modest inventions as the printing press, the steam engine, and the Internet. 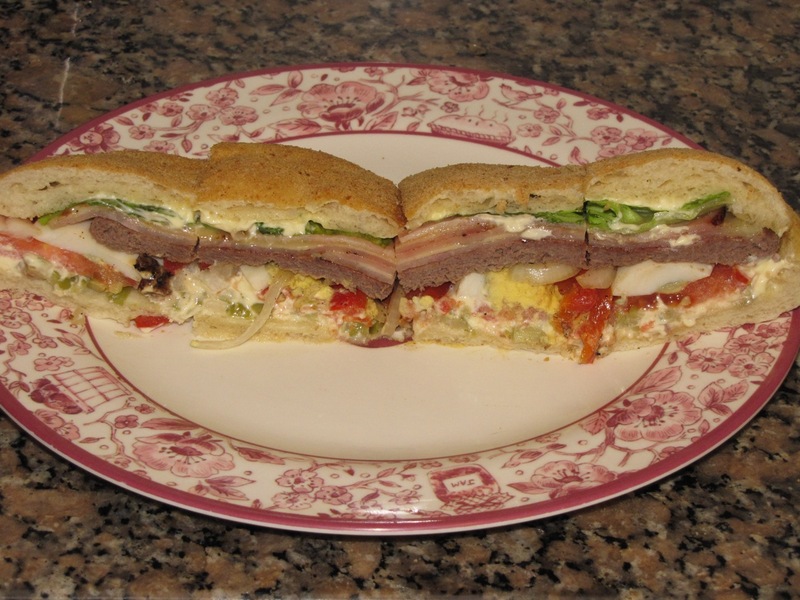 The sandwich was bestowed upon the human race by John Montagu, an eighteenth-century British statesman. Montagu was the fourth Earl of Sandwich, and possibly the greatest man of his millennium. I salute you, Lord Montagu. Long may your name be remembered and your namesake relished! 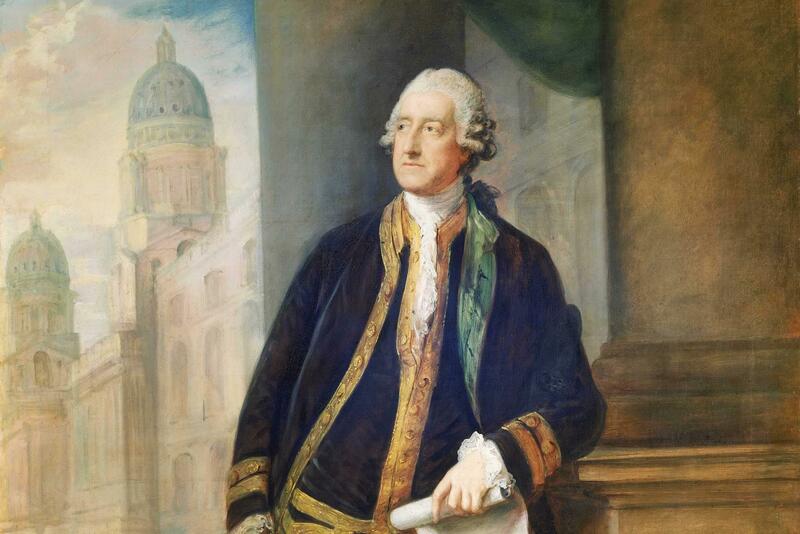 As the story goes, the Earl of Sandwich wanted to eat while working without making a mess. (A popular version of the story suggests Montagu didn’t want meals to divert him from playing cards.) He asked his servants to bring him meat between pieces of bread so that he could eat without using silverware or getting his hands dirty. Montagu’s culinary triumph was eventually named after him, and the rest is history—shining, glorious history. I have had the privilege and pleasure of sampling many sandwiches in my twenty-something years. (Heck, I ate a sandwich just an hour or two ago.) The possibilities are endless. There are hundreds of varieties of bread, and thousands of ingredients to mix and match. Whether you prefer a simple turkey and Swiss on whole wheat, a sweet honey and butter on white, a robust blend of meats and vegetables on an Italian sub, or any other of the millions of combinations out there, there is a sandwich for you. My personal favorite is the chivito. It is written, “Man shall not live by bread alone.” I’m pretty certain this ancient Scripture refers specifically to this sandwich. The chivito is a sandwich popular in Uruguay, where my parents live and work. 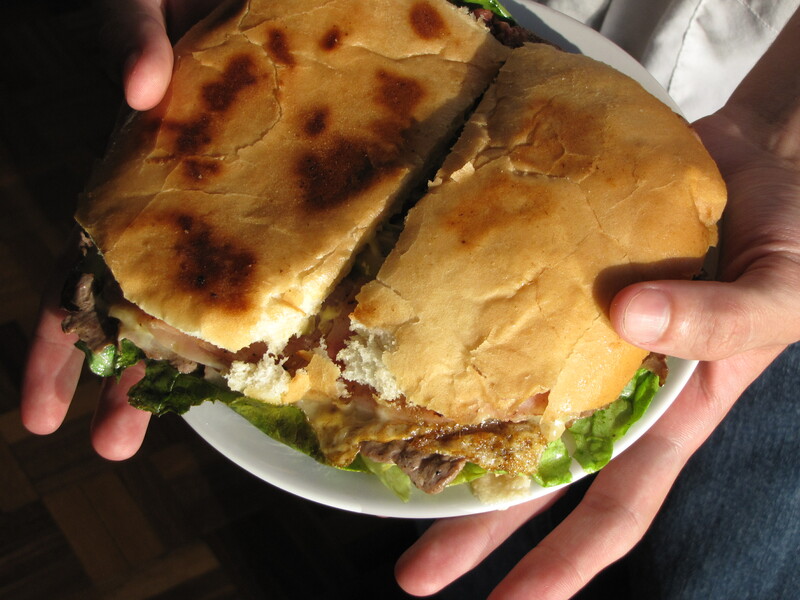 In Spanish, the literal meaning of chivito is small male goat, which is a misnomer in the case of the sandwich: the Uruguayan chivito contains beef, eggs, lettuce, tomatoes, and occasionally mayonnaise, bacon, onions, peppers, olives, or cheese. Chivitos are the best sandwiches I’ve ever tasted, and I spent three and a half years in college working part-time in a sandwich shop. I know sandwiches. The chivito is by far my favorite sandwich, and possibly my favorite food. While visiting my parents, I dissected this chivito prior to eating it. For science. I haven’t tasted a chivito in years: my quiet corner of Indiana boasts no such exotic sandwiches. All the same, I continue to enjoy old favorites such as turkey and cheddar, peanut butter and jam, grilled cheese, and a variety of subs from local Subway restaurants. Now if you’ll excuse me, I need a sandwich. This entry was posted in Life, the Universe, and Everything and tagged college, personal, random by Adam Stück. Bookmark the permalink. Why don’t you just make a chivito?! In fact, make two, I’ll stop by to share in the experience. Sandwiches are indeed delightful. One of mankind’s greatest triumphs. Then you have grilled sandwiches, and things are taken to a level where you consider humanity might have a little hope in it after all. I, um, don’t ever cook. Well, my job occasionally requires me to prepare meals, but that hardly ever ends well. Everyone suffers when I cook — I most of all. It rather depends on the sandwich! In the case of a chivito, I’d have to cook beef, boil eggs, and fry up a mixture of onions and peppers — in addition to procuring the right kind of bread, along with lettuce, tomatoes, bacon, cheese, and the other requisite ingredients. I love a good chivito, but I ain’t doing all that for one sandwich!